We are crewed by a professional crew. We always have a PADI Instructor, Boat Captain, and Divemaster on board. Our crew is fully insured on board and in the water. We are a Dive Charter run by Divers! In water supervision is available upon request. Instructors are welcome to use the Arrow as a teaching platform for your students. With 4 or more paying students the instructor is free. Full Air fill station at the Harbor. Rental Equipment is available at the dock. Check St. Lawrence Seaway water conditions HERE. Please contact Freedom Scuba USA to secure your charter date prior to purchase of charter seat in store. 2 Tank Charter on board The ARROW. The America, as it is most commonly referred to, was actually named the "American". 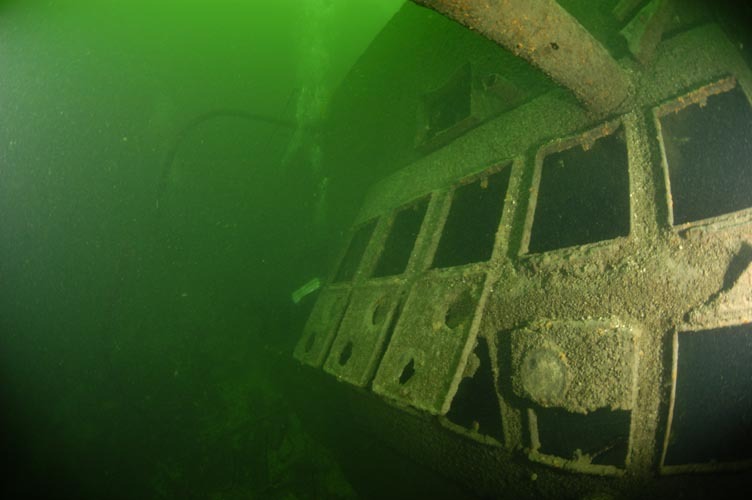 It was used as a blasting barge to make sure parts of the St. Lawrence River was clear for ships. The wreck site is located just across the shipping channel from Jordstat Castle and Dark Island, just east of Mallorytown Landing. The wreck lies on the US side of the river. Canadian boats going to this wreck must check in with US customs first. The America came to a sudden end as a result of an accidental explosion in 1932, The ship sank in an overturned position near some shoals, but currently rests in about 75 to 80 feet of water. Care must be given when diving the site. 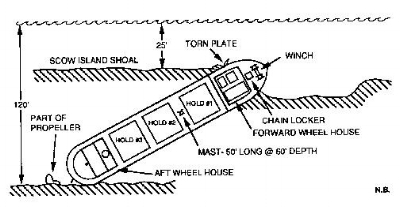 The mooring buoy is in shallower water, but the strong current must be considered when traversing the guideline that runs from the large anchor (which actually wasn't from the America) at the mooring site, which goes over some shoals and down the slope to the wreck. 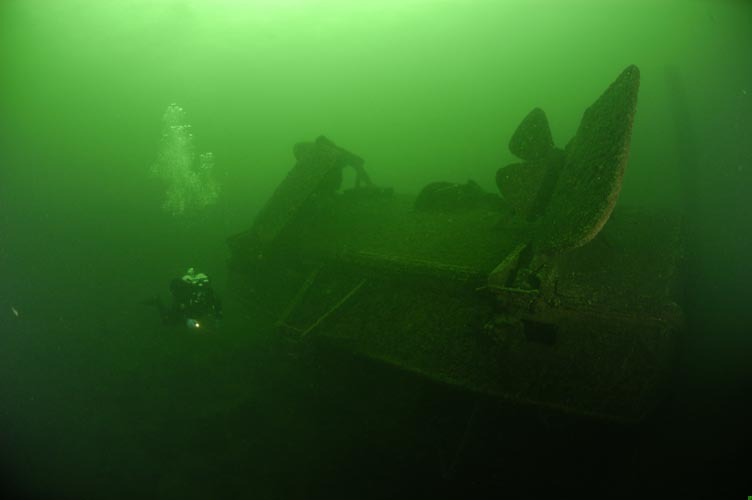 Underneath the wreck lies a heavy layer of oily silt, so care must be taken not to touch or drop down into the silt, lest your gear becomes coated with black oil. 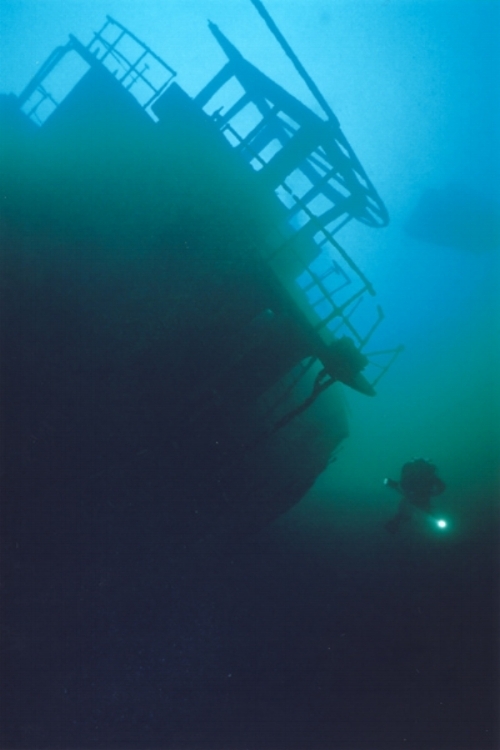 The underside of the wreck can be easily penetrated, with easy access to the outside from both sides. On the wreck itself, the current is very manageable. 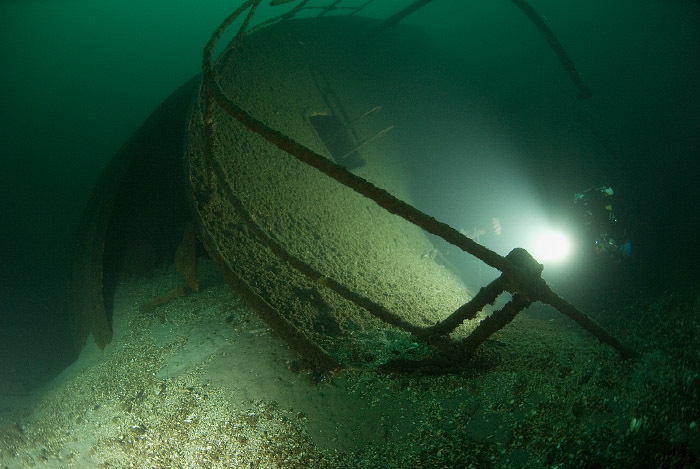 However, it can be a struggle getting to the bow of the wreck. If you choose, you can then ascend to the top of the wreck (the bottom of the ship since it is overturned) and fly the keel back to the stern. You will see the two large props protuding from the stern. Be sure to grab the line as you reach the stern or you may be in for a ride into the shipping channel. The Henry C. Daryaw was a 220 ft long steel freighter that sank in 1941 when she ran upon a shoal between American and Canadian Channels. The navigator did not see the shoal in a deep fog and Daryaw ran into it striking her bow. The Daryaw flipped upside down while sinking and landed right next to the channel wall with the deepest part at 90ft.